I struggle to begin this, for regret weighs heavily upon my heart, but I long for you to know how sorry I am. I know that, in love, you will scoff and tell me not to be silly - I see your reaction quite clearly as I write this, even though you've been gone for over three years now - but this needs to be said. When I was about 7 yrs old, through an incident we need not focus on - one that in no way was your fault - I got it into my head and heart that you didn't love me. The lie gripped me so strongly I was convinced it was the truth, and I followed that lie through my childhood, all through my teens, and way into adulthood. Only now, 38 years later, do I realise how wrong I was in accepting that lie as truth, and how much damage it has caused. I've been walking with God for 19 years now, in an intimate, loving relationship, so you'd think after all this time I would've realised it was a lie. I mean, the truth sets free, doesn't it. I wasn't healing completely in that area; I still ached in part, and that ache was still effecting my confidence and other relationships. So that should've told me it was a lie I was holding on to. The truth stood boldly before me last weekend, Mum. I went with Karen to visit Sue in hospital... These two women [both sisters through marriage to my brothers] still reflect their love for you, and the beauty they knew you possessed. They've been part of our family for well over 30 years, and it turns out they knew you very well. They loved you so much. They still do. I didn't realise just how honoured they were/are to be your daughters-in-law. I love seeing you through their eyes. I wish you were here, Mum. I so long to hold you... but more than that. I want to tell you I'm sorry. I realise now I held you prisoner to my lie for 38 years, and in doing so kept a wall between us. I see oh so clearly, and quite painfully, now, that keeping you prisoner to the lie, and to the pain born of the lie, I never got to see YOU. I knew you as Mum, and sometimes as 'the parent who left me'. But I can't remember thinking of you as WOMAN. This last part grieves me so deeply. This brings me to tears instantly, my heart so thick and heavy in my chest... I mean, here I am someone who tries to see into the hearts of others, in order to present them with a reflection of their true beauty and worth, while encouraging them to be themself and tap into their passion and dreams, and I never took the time to do that with you. I hate that... :( If I could turn back time and change anything, it wouldn't be the divorce, or you leaving - which I now feel was not as black and white as I thought it was. I would change my relationship with you. I would step out from the label of 'daughter' and have you take off the 'Mum' hat for a while, and take time to get to know you. To see what made you tic. To view your passions, to hear of your dreams, and to somehow encourage you towards them. I regret not doing that. As 'mum', I know you would tell me not to be sorry, life is what it has proven itself to be and we can't go back and change anything. And as a WOMAN I am pretty sure you would also say that. I know you forgive me. In fact, you would say there's nothing to forgive. You would hold nothing against me, and in your love you'd probably justify me reactions... but as a woman, and as your child, I just want to say I see you now. And, Shirley, :) you are beautiful in my eyes. ...I've been wondering why it's taken so long for me to see the truth of your beauty and love, and I think it's because I finally got to walk in your shoes. You were in your early 40s when our family fell apart, with an empty nest approaching. Here I am, in my mid 40s, with an empty nest approaching. Many thoughts have been going through my head of late, such as "Who am I beyond my children?" "Is there more to be than 'mum' and 'wife'...?" "Do I like the me that walks side by side with my husband?" "Do I like my husband...?" And I'm finding a lot more time to be me, but I've been wondering who that 'me' is, exactly. God has been trying to get me to accept 'me' and the passion that lies within me, for years now, but I've struggled to do that. Shame found me when I was a little girl, stayed with me all the days of my life, and convinced me I was worth very little to anyone or anything in this world. But that was lifted from me a few weeks ago, and that opened me up to wonder more about what I, as a woman, want from life... I saw beyond the title of mum, and that of wife, and wondered what was left... In all my questioning, I found discontentment. In that, I found my mind wandering to a world beyond mum and wife, and struggled to 'keep my place', and through that and the desires attached to it, and in light of a few other things of old, I came to understand why family's fall apart. I suddenly understood why ours did - maybe not completely, but a little more. All this helped me to feel you, to see you, to know you a little more intimately. God impressed upon my heart years ago, "If you could write a letter to everyone you know, what would you put in it?" to which I replied, "I would look into the heart of each person, find their true worth, and present that to them..." and He has gifted me to do so, and from this the idea of a book called "Letters to a Friend" was conceived. However, He'd gone on to say to me, "Before you write Letters to a Friend, honour your mother and father..." but I struggled many times to do so. I tried, but the words for a chapter such as this never came, and I know NOW, on the other side of freedom, that the reason I couldn't write it was because my heart was not honouring you completely. Rather, it was honouring the lie and keeping you prisoner. Now that the lie has been revealed and truth has come, I can see YOU, and in seeing you, in seeing there were reasons beyond your control for the breaking down of our family, and in seeing the true beauty that IS you, my heart humbly bows to you and honours you as the wonderful woman, wife and mum you were, and will always be in our hearts. Mum, I see you... the lover, the mother and the woman... You make me want to be a better, more loving and giving person, in all of these areas. In travelling in your shoes of late, I see how important it is to be true to self, but also find that being a mother is a far more worthy profession that this world proclaims. You never did get your full rewards here on earth, but I trust God had them waiting for you when He took you home. 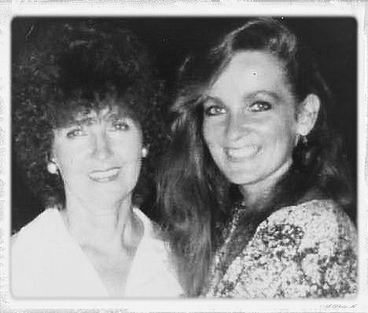 Shirley J Keevers... with all that I am, I thank God for you, and I love you...I am honoured to be your daughter.